Since we initially evaluated Sage 300c, there have been a number of updates and features added. We wanted to ensure you had the latest information. First, Sage 300c will now be called Sage 300cloud. Previously, the ‘c’ in Sage 300c stood for a few things: connected, collaborate, and customer focused. The “C-line” (Sage 50c, Sage 100c, Sage 300c) are hybrid cloud-based solutions. This means that businesses experience the benefits of cloud, including access to Sage 300 via any device with an internet connection (web screens, mobility, etc. ), while still being an on-premise system. Sage continues to add to the available web screens on 300cloud. For a list of the web screens available with Sage 300cloud, click here. When we initially evaluated 300c in 2016 below, only the financial modules had web screens available and within those screens, specific functionality was missing such as financial reporting, customer inquiries, vendor inquiries, credit card payments, modify finders, and custom crystal reports, could not be launched from the web screens. These features are now available and the operational modules (Order Entry, Inventory, and Purchasing) have been added. There are still modules that are not yet web-enabled such as Payroll, Project and Job Costing, Consolidations, and Inter-Company. We find the web screens in version 2018 are more comprehensive. While all 300cloud users may not prefer the web screens over the classic client, selectively implementing web screens for specific users such as those in sales or purchasing roles may prove to be beneficial. According to a survey that Sage conducted in 2017, accounts payable automation was the most requested new functionality. That’s probably why they introduced Sage AP Automation which is available to Sage 300cloud customers beginning with the 2018 release. Sage AP Automation is designed to simplify and remove manual tasks from your entire accounts payable process, from purchase to payment. Invoices enter your Sage 300cloud system with guaranteed accuracy and are stored securely in the cloud, saving time and removing the complexity from manual data entry. Contact us for more product details or to see a demo. Sage Intelligence Reporting Cloud runs on your Sage 300 server and you can access reports from the Intelligence menu within your Sage 300c web screens. Sage Intelligence Reporting Cloud is a new web-based financial reporting engine that integrates directly into Sage 300cloud. It offers ready-to-use – and customizable – online reports that can also be viewed in Microsoft Excel. All reports can be updated and filtered using the accounts, group category, or account groups of your choosing by creating a copy of the report and updating the row sets accordingly. How does the pricing model differ? 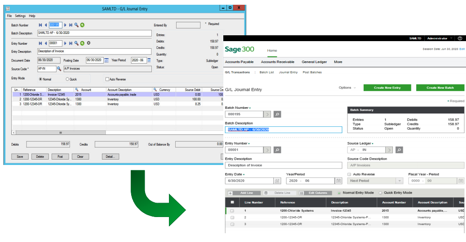 Sage 300cloud is a subscription product priced per user. Sage 300 is perpetual or one-time purchase licenses with annual maintenance (optional). A perpetual license is the ‘traditional’ model used to purchase software. You pay for your software license up-front and have the right to use it indefinitely. On top of the license fee, you will have the option to pay for annual maintenance, which is renewed annually. What is a subscription licensing model? With a subscription licensing model, you pay a per user fee, which allows you to use the software during the subscription term. The key difference being you don’t own the software, instead you lease it. The subscription payment includes your software licenses, access to support services, and new versions of the software as they are released. If you stop paying for your subscription, your software will no longer be active, but you will have read-only access. Processing will no longer be available. Is Sage 300cloud a cloud solution or SaaS? Sage 300cloud is still installed “on premise”. It is still installed on a server at your site or can be hosted elsewhere, just like Sage 300. Some additional security and configuration is required to enable web access, which we are happy to assist you with. In addition, the same desktop user interface you know and love is still there! No re-learning a new user interface if you do not want to. You have a choice to use either one you prefer. Released in Q4 2015, Sage 300c was introduced by Sage as a deluxe offering with new features that include a modernized interface, highly customizable web screens, and browser-based screens that are easier to access from a range of devices including desktop, laptop, tablet or even mobile phone. 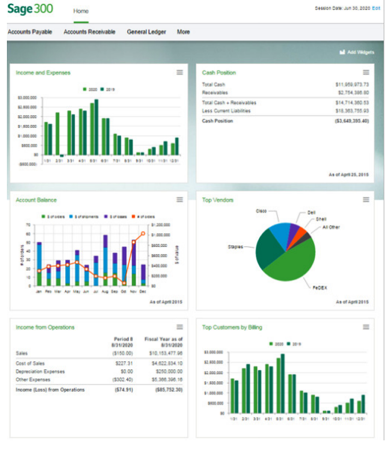 Sage presents 300c as an additional layer to their “classic” Sage 300 system, advising that the new web screens can run side by side with the classic screens to give users all of the standard functionality with the same database and business logic, in addition to the exciting new features. This article will outline the noteworthy features of Sage 300c, address some frequently-asked questions, and provide an honest evaluation of whether upgrading to 300c is right for you and your organization. Sage 300c is instant access to the latest financial information, whether users are at their desks, meeting with a client, or on the road – the new screens have been designed with mobile access in mind. The Sage 300c homepage features up to 12 customizable widgets providing a direct snapshot of KPIs (key performance indicators) with a single click. But it’s important to note that Sage 300c is NOT a new product – it simply offers unique and modernized web screens and mobile access that are not available with the classic Sage 300 software. While the release of Sage 300 version 2016 (classic product) delivered additional features and core product enhancements, it DOES NOT offer these same web screens, dashboard widgets, and mobility options that currently represent the core differentiators of Sage 300c. It’s worth pointing out that the classic Sage 300 does offer a browser-based portal that allows you to access a select range of transaction screens over the web. The difference is that Sage 300c offers web screens with a more modernized look and coupled with web-based functionality that leverages current technology. Sage 300c is a subscription product priced per user – perpetual or one-time purchase licenses are not available like they are with the classic Sage 300 product. Existing clients on a perpetual license that are looking to move to Sage 300c will be upgraded in phases as their current Business Care plans expire. For existing clients using the classic product, the cost to upgrade to Sage 300c will be their current Business Care renewal price + 15%. Clients that paid upfront for their Sage 300 software would be moved to a subscription pricing model as part of the upgrade. Sage 300c is 24/7 access to new and modern screens in addition to – not replacing - the classic Sage 300 user interface (UI). Customers who choose to implement Sage 300c can still access and benefit from all of the features available in the standard Sage 300 Version 2016 release. This includes third party modules, macros, customization of classic UI screens, and third party integrations. However, readers should note that most of these features are not yet available using the new web screens. As of the posting of this article (March 2, 2016), the initial release of Sage 300c does not support certain screens in the Financial Modules, any Distribution modules (IC, OE, PO), macros or third party products. Release 2016.1 has been rescheduled from February to a March 2016 release. Sage 300c is NOT hosted nor does it replace Sage 300 online, a cloud offering by Sage. Sage 300 Online continues to offer an affordable hosted solution for basic accounting and reporting needs for organizations that do not require multiple databases, customization, or most third party modules/integration. Ultimately, Sage 300c is a work in progress. Although Sage was wise to step forward with a fresh new feel for their mid-market accounting solution, the CURRENT release of Sage 300c does not meet the high expectations that clients have developed after years of using the classic version of Sage 300. The new web screens promise instant access to dashboards and reporting, however the limited features in this release reduce the incentive to upgrade. Fortunately, Sage has indicated that at least two new versions will be released in 2016 and with each will come additional features and functionality. The roadmap below reveals what customers can expect to see in the new versions. Please contact Equation if you would like to receive a comparitive list by module of the screens available in the classic view vs web screen. Sage 300c – Is it right for my organization? Here’s a general guide we’ve developed to help customers determine whether Sage is the right fit based on common scenarios we’ve seen within our own customer base. Your organization is running on a Pervasive or Oracle database platform and you are not in a position to migrate to MSSQL. Sage 300c can only be used with SQL server. Your organization would want to access Project & Job Costing through the web screens. 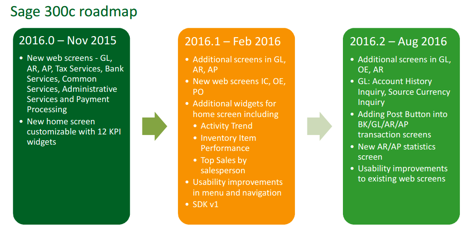 Sage has not mentioned the PJC screens in their roadmap for future versions. Although they are likely to support this functionality, it is unclear when the screens will be available. Your organization needs or uses Order Entry and Inventory Control. Support for kits, bill of materials, serial numbers, lot tracking, Order Entry shipments and Order Entry invoices are not currently available. Purchase Orders is available but would have restrictions for projects, serial and lot tracking. Your organization would require use of the GL Consolidations, Payroll, or Intercompany modules which may not be available until 2017 or later. Your organization would require customization of web screens or the ability to run custom crystal reports or macros. 300c will offer customization abilities in future releases. Your organization would want to access third party products using web screens. This release of Sage 300c does not support third party integration in the web screens and it is unclear when this functionality will be available. Your organization does not currently own Sage 300 and 300c would be part of a new implementation. Existing perpetual clients paying the 15% “upgrade” cost above their annual business care renewal are likely to feel that the current features do not justify the additional cost. New Sage clients, however, may see the higher upfront cost as a long term investment as 300c will undoubtedly add new features and improvements in each future release. Your organization does not wish to make a large upfront investment in the purchase of accounting software and Sage 300 Online does not have the necessary functionality. Sage 300c is currently the only subscription offering of the full 300 product. Existing subscription clients can continue with their subscription until their term expires or can choose to pay the new subscription pricing to move to 300c. Subscription terms range from 1 year – 3 years with discounts available for prepaid subscriptions. Upfront costs include per user fees based on the bundle selected – Essentials, Advanced or Complete. Given the limited features and modules available in the new web screens and the 15% “upgrade” cost for existing clients, Equation Technologies is not yet ready to give Sage 300c a green light for any organization as it stands today. However, our team looks forward to the anticipated February/March 2016 product update and other news about added features and improved functionality in future versions of Sage 300c. Once the product features have been expanded and the future direction of the product is clear, we will issue updated recommendations for our Sage 300 clients. You may be wondering who we are and why we’re qualified to comment on Sage 300c. Equation Technologies has been a Sage Business Partner for 16 years and our sole focus is on the implementation and support of Sage 300 software. We are recognized experts in the Sage 300 community and our number one priority is ensuring that our clients get maximum benefit from their software investment, which is our motivation for providing this candid assessment of Sage 300c.